How to use our Online Shopping Cart? 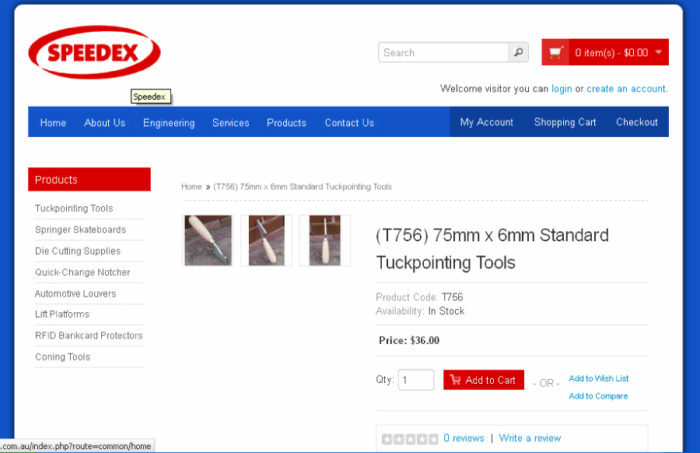 Home » Tuckpointing Tools » How to use our Online Shopping Cart? Online Shopping Carts are not the easiest things to use so if you do not understand how to use our shopping cart then please dont worry! It is not very hard to use and we will hopefully help give you some brief instructions and steps below to help make purchasing easier from our new online store. Fistly make sure you are on one of our Product pages. 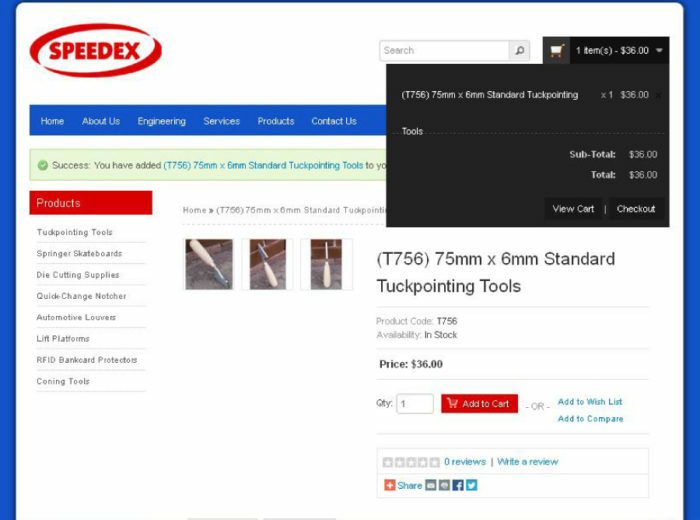 Select from top menu under horizontal menu heading "Products" and select category for example "Tuckpointing Tools"
Once you are in this Tuckpointing tool section you can then click on various products and you will then be directed to separate product pages, for example "Standard Tuckpointing Tools" page. 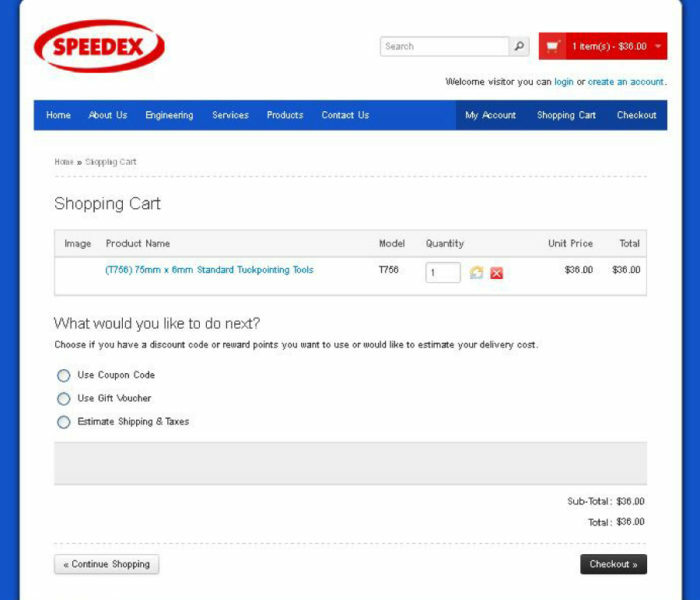 In order to buy from our online store you have to first click on the red box which says "Add to Cart" on the item that you are interested in purchasing. 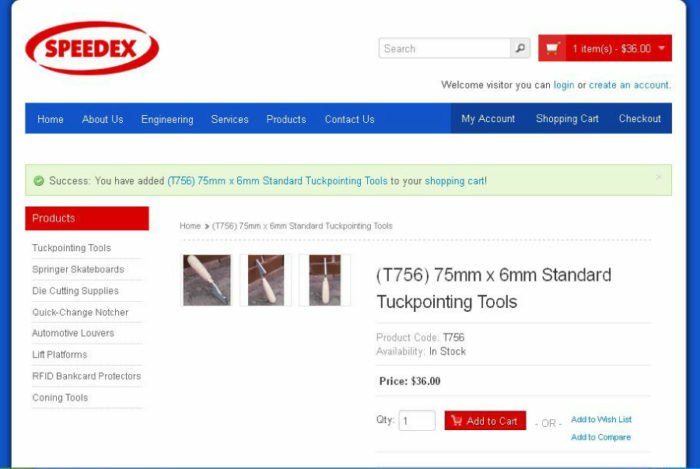 For example lets say you want to purchase a single T756 Standard Tuckpointing Tool. All you do is click below on the "Add to Cart" red box below the product picture you wish to buy. After clicking on a particular product for eg. T756 you will see the following page below. Then if you decide that you wish to purchase this item, you can enter in the QTY you are after next to "Add to Cart" red box above and then you simply click the "Add to Cart" red box. After you click this item you will notice that in the very top right hand corner of our website (on every page) shown below that the shopping trolley shows up saying 1 item (s) -$36.00 has been selected. This means that a product has been placed into the online shopping trolley. 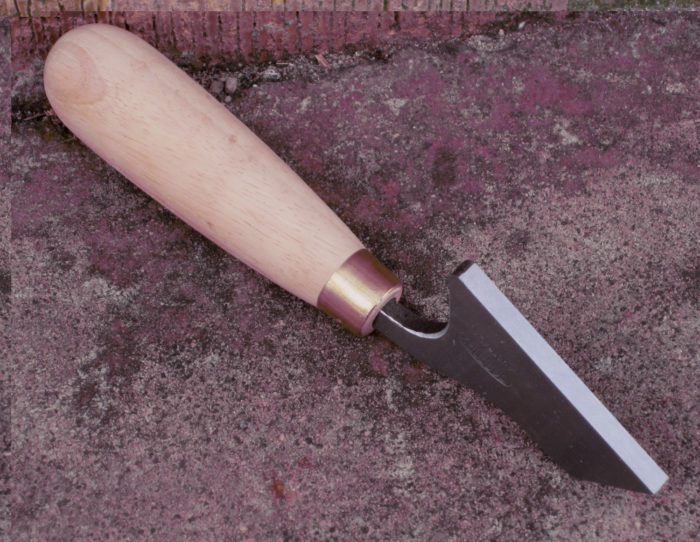 You can select other products and add to the shopping trolley, but for this example lets say you wish to buy one tool only. So next you click on the top right hand shopping trolley red box (1 items (s) -$36.00 etc..) and you will notice that a larger dark grey box will come down which lists all the products you have selected to buy with prices and total price. Please see the picture below top right hand corner. You will also see two darket boxes at the bottom of this grey drop down box which says the words "View Cart" and "Checkout". You can click "View Cart" if you wish to see what you have purchased in more detail or simply "Checkout" if you have finished with shopping and now wish to now pay for the tools etc. For this example we will choose "view cart" so you can see what you have selected prior to checking out. So after clicking View Cart you will now see the page below. With the item and price. If you wish to alter the QTY or delete a particular item you can enter a different QTY in the box under "QTY" or click the red "X" to delete an item. Please note you can still go back into our website pages to make addditional purchases or view other products and it will not change or delete your order, and you simply have to click the top right hand corner trollwy box to then get back into viewing your items in your shopping cart. "What do you like to do next?" 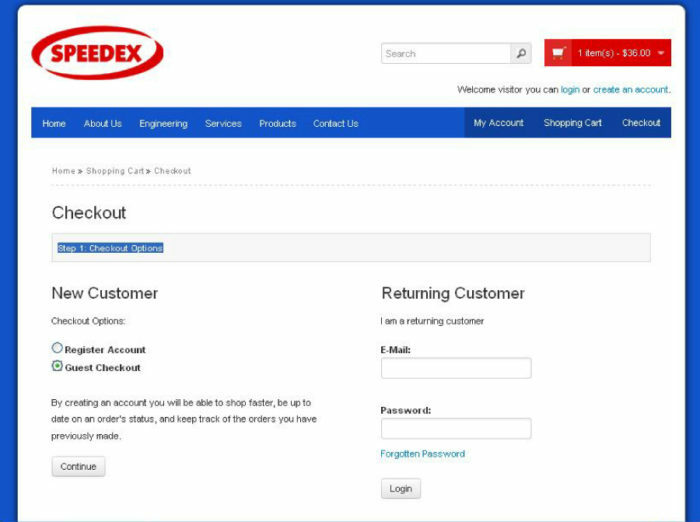 After recieving your shipping prices you can then proceed to checkout by clicking the "Checkout" dark grey button in bottom right hand corner (seen above). For our example here we are going to select "Guest Checkout" option as it will be quicker for you to do. You are then prompted to enter in Your Personal Details. So please neter in your first and last name and email address and phone number and delivery address. Please see example below. The shopping cart for some reason does not highlight the "post code" for some reason with a red asterisk but please enter in your post code as this is very important so your parcel will get to you correctly! A contact phone number is also very important as it helps the courier / Post Office etc phone you incase of any problems, so parcel reaches your correctly and in a timely manner. 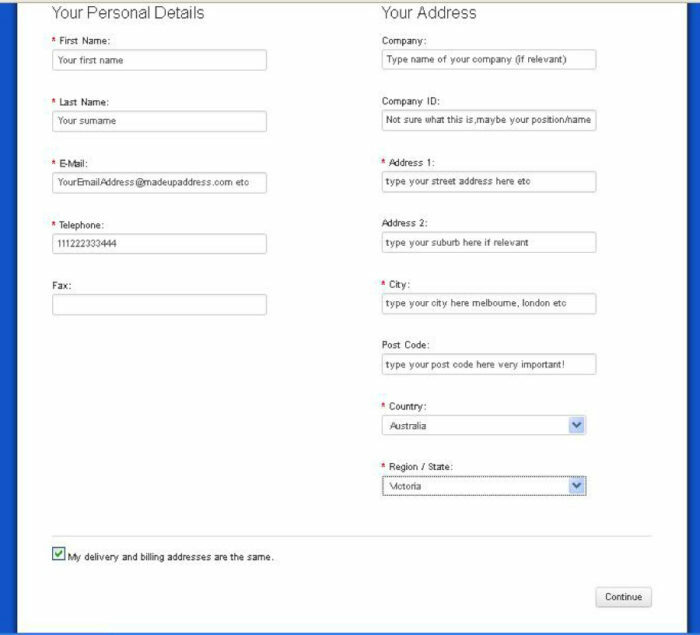 If your delivery address is the same as your billing address then please click / unclick box. Please note we dont physically post invoices or receipts to your address (when using online shopping cart ) as these are generally sent automatically to your email address via PayPal once you have completed payment which we will show you below. So your correct email address is usually very important so a receipt can be sent to you. After you have entered in all your personal information please then click button "continue" on bottom right hand corner. 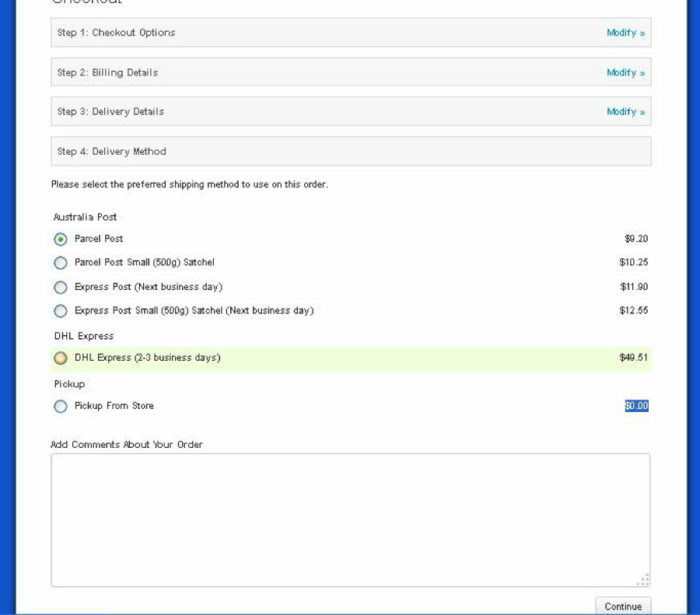 After selecting "continue" you can then select our shipping options. Currently we are offering Australia Post and DHL services and also pick up from our factory if you plan to come in person (However if you are planning to visit us you can pay here face to face by credit card so shopping cart may not be applicable but may be useful to phone us to help prepare your items so we have them waiting for your arrrival). We have decided to offer local Parcel Post, local Express Post Satchels,and international AIRMAIL, Registered International Post and DHL Express Worldwide options so our customers can choose what service they prefer depending on price and speed and where they are located. We do not offer "seamail" by default due to slow speed as seamail takes 2-3months for parcels to be delivered, so cannot send goods in reasonable times using seamail. However if you really want seamail then write to us and we can arrange it. AIRMAIL and Registered Post International have delivery time of 3-10 business days. AIRMAIL has no tracking & no signature on delivery. Registered Post International has tracking and also signature on delivery at most destinations. DHL Express Worldwide is the quickest option - 2-3 days delivery door-door service, and full tracking provided automatically to your email address, so quickest and highest quality service. 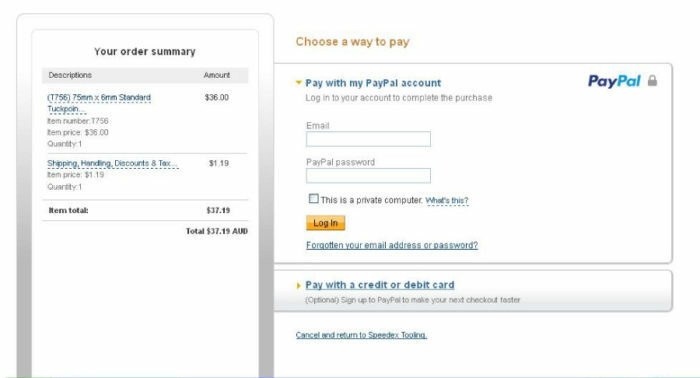 We only accept paypal payments currently, but if you dont have a paypal account you can still click "pay with a credit card etc" and still make an easy payment without registering an account with paypal. Other payment options hopefully available soon. You may also wish to add a comment. 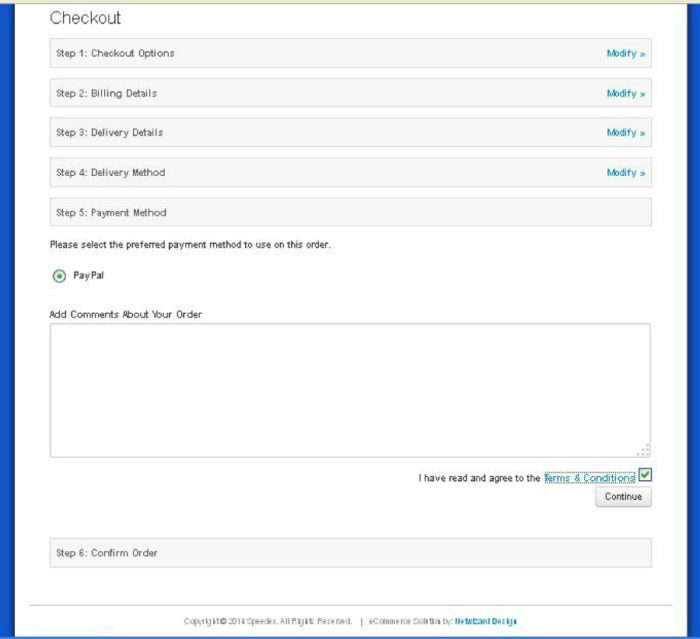 After clicking "Confirm Order" you will then be directed to the Paypal website and a screen below will appear, showing items purchased and delivery methods on left side. You can select "Pay with my PayPal account" if you already use Paypal and have a login and password etc. If you do not use Paypal you can simply click on "Pay with a credit card or debit card" and you will be prompted to fill in your details and card information and then you can simply pay using any credit card or debit card. You have now successfully used our online Shopping cart and hopefully it wasn't that difficult! 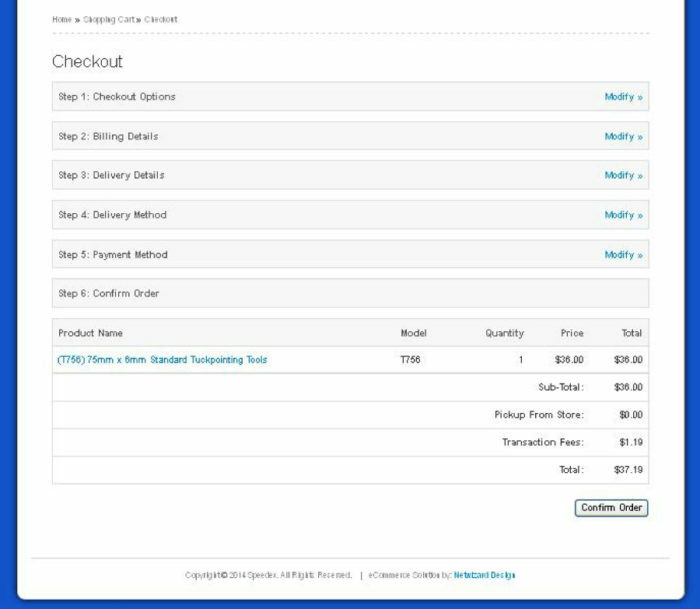 You should recieve an automatic notifiation via paypal to let you know your order has been processed and our shopping cart or paypal should send you an electronic invoice or reciept for proof of purchase and one that you can print out for your record keeping or tax purposes. We will recieve your order electronically and then we will immediately put your order together and send it ASAP by the delivery method shown and to your address details. Thankyou for your order!! Best regards, from the team at Speedex.